I find kali daal to be truly a global flavor. Black beans in it's different forms are quite common in Mexican, Moroccan middle eastern and even African cuisine. 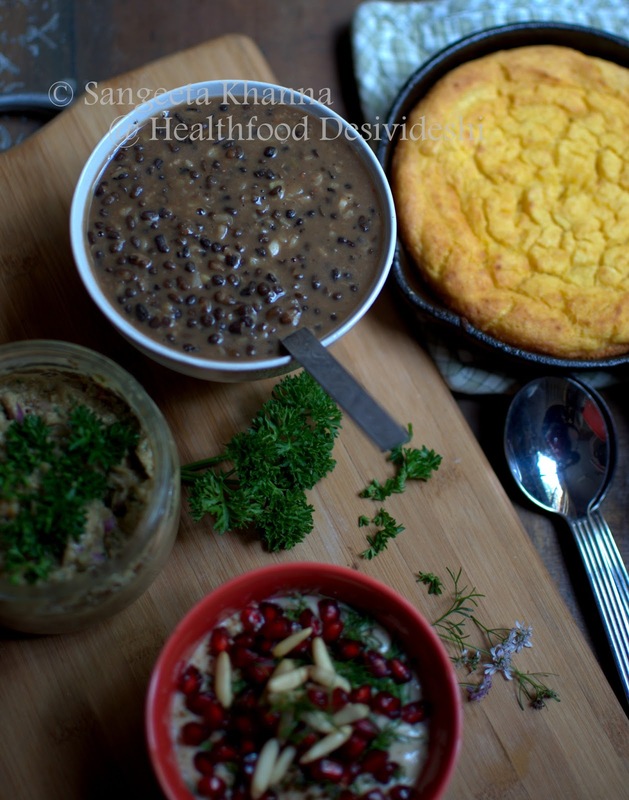 South Asian cuisines have been using black beans even in fermented form. No wonder, a nutritious bean has been a part of food culture everywhere. Darker the skin of a bean, more nutritious it is generally. Mineral rich, good vegetarian protein and goof quality fiber (soluble and insoluble both). We know they serve good food at langar. I crave for such rustic langar food many times, cooking a kali daal itself becomes a therapy. Rich creamy and just mildly spicy. Have you heard someone talking about a daal so lustfully. Beans and daals and the winter red lentil soups are my all time comfort food. I can't live without them. Some days are like wanting for a sensory overload of flavors. This happens when I want many flavors that belong to different food cultures and yet want them all to come together for a single meal. I had grabbed a fresh bunch of curly leaf parsley form a recently planted parsley in the garden and the coriander greens are flowering. Coriander greens turn the most fragrant when they flower and are just about to bear fruits. I want to use them in appropriate recipes so the full potential of the herb is utilised. The aubergine dip with pomegranate seeds and pine nuts was just perfect for this. Thanks to Ruchira who made me taste a wonderful aubergine dip whose name I still can't pronounce, but I have made it quite a few times since then. She says the dip is called Bajahan. This aubergine dip is quite close to that. Blend the first 5 ingredients together in food processor. 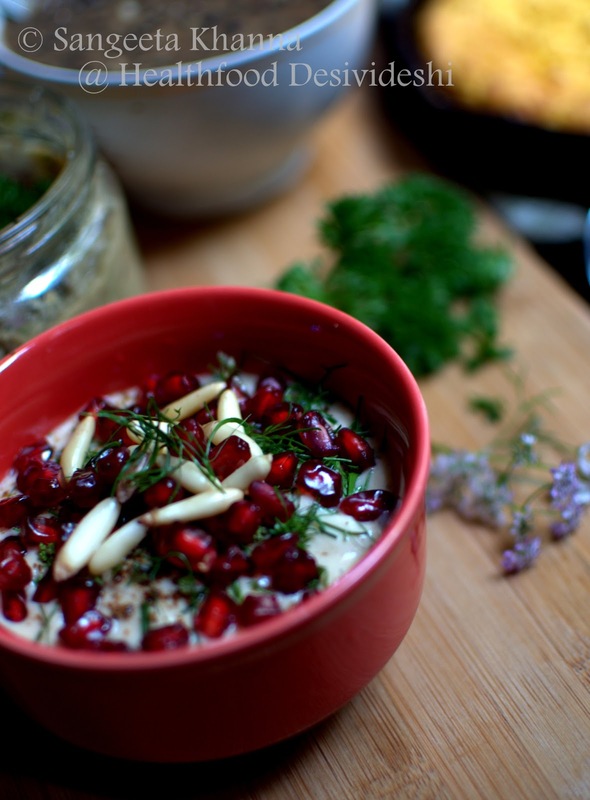 Top with the Pomegranate arils, pine nuts and chopped coriander greens and serve cold or at room temperature. The fresh parsley went into a chunky Guacamole that had finely chopped onion and sun dried Cheri tomatoes into it. This buttery dip is a better spread than butter for breads. Especially when the breads are gluten free. Mix everything together and mash properly to make the dip smooth with chunks of onions and sun dried tomatoes. This dip tastes best when fresh so mix as much amount as you think you can finish in one go. Or use the leftovers really soon. I normally do not like Avocado flesh exposed to too many flavors but this dip works nicely when you adjust all the ingredients to your taste or skip the stronger flavors (*especially the garlic and green chilly) depending on what kind of bead or cracker you are going to serve it with. 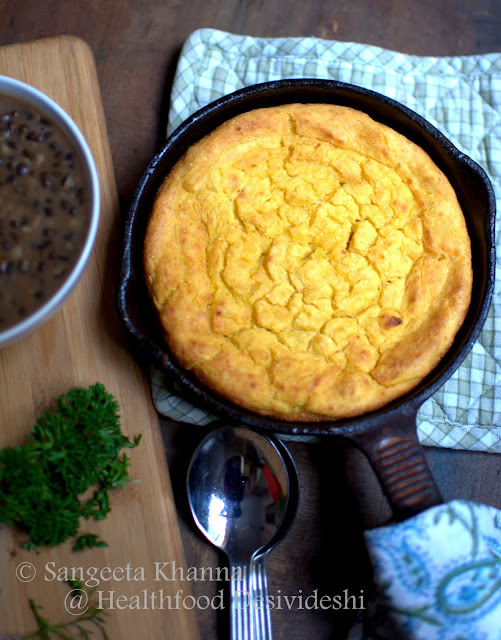 Heat 2 tsp oil or ghee in the cast iron skillet or whatever vessel you are using to bake the skillet bread. Keep the ingredients handy so it can all be mixed within a minute and poured into the skillet. Mix the soda bicarb with the cornmeal. Mix the salt and pepper too if using. Any chopped herbs or dried herbs can also go into the dry mix. Whisk the yogurt with the fresh cream or melted butter and then add the cornmeal mix to it. Whisk to mix well, you would notice the batter getting a little frothy because of the soda bicarb added. Pour it quickly into the hot skillet. Cover with a lid and let it cook for about 5 minutes on very low flame. Preheat oven for the 5 minutes at maximum temperature possible in your oven in the meanwhile. Transfer the skillet from the gas stove to the oven and adjust the temperature to 180 C and bake the bread (uncovered) for about 30 minutes or till a skewer comes out clean. My skillet was 16 cm size so the thickness of the bread demanded a longer baking time. Wider skillet would require lesser baking time. Alternately, you can keep the skillet on the gas stove and let the bread cook till done. But keep the lid on while it cooks. The top wont get browned if you bake it on the gas stove but he base would get nice and brown. Brush the remaining 2 tsp butter or ghee on top crust of the bread once baked. Slice into wedges and serve as required. This bread tastes best when warm. So reheat it if serving the leftovers. it tasted awesome with the kaali daal and these two dips. We took second and third helpings and stuffed ourselves like fat bunnies. This is what I call good food. Real and nutritious. You can never eat too much of good food. The quantity will always be self limiting. By all means. The bread would be nice with sarson ka saag as well, a new twist to the traditional makki ki roti sarson ka saag. I told you some foods are global in their appeal, and the flavor combinations. This is really a delightfully eclectic meal you have put together! 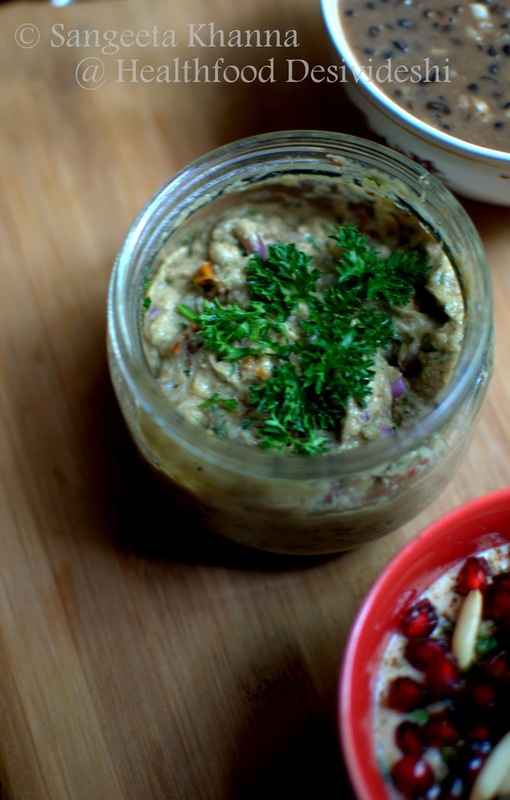 The aubergine dip sounds absolutely delightful! I have tried guacamole a couple of times myself, but never with sun-dried tomatoes! Must try this the next time... 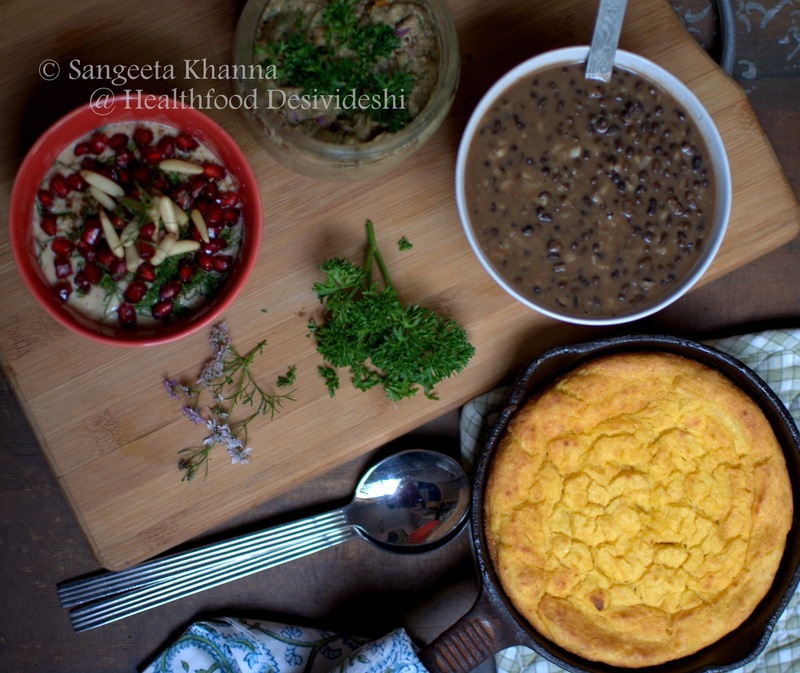 I love the combination of cornbread which goes so beautifully with the dips as well as the hearty kali dal! A beautiful spread of flavors. EVerything looks so tasty - I love cornbreads in any flavor shape and form!